1990-11-22 First worldwide family litigation filed litigation Critical https://patents.darts-ip.com/?family=23949192&utm_source=google_patent&utm_medium=platform_link&utm_campaign=public_patent_search&patent=EP0124331(B1) "Global patent litigation dataset” by Darts-ip is licensed under a Creative Commons Attribution 4.0 International License. While users with a number of television devices will benefit from the availability of a unified remote control transmitter, manufacturers will have to manufacture individual remote control transmitters for respective television devices for users that presently only own a single television device, e.g., a television reciver, in addition to unified remote control transmitters. While a large section, e.g., the driver and transducer section, of individual and unified remote control transmitters can be made the same, the respective control portions cannot readily be made the same because they must generate a variety of different remote control messages. The latter is particularly a problem where a unified remote control transmitter has control keys which are shared for the control of different devices. Manufacturers incur inventory and testing costs because of the need for different control sections which may be passed on to consumers. The present invention is directed to solving this problem. EP-A-0002434 discloses a computer-controlled remote control transmitter with which many different functions can be controlled remotely, the range of functions possibly covering more than one remote device, while the transmitter has a simple keypad. The function to be controlled may be determined by a control key inserted into the transmitter. It is not clear how the transmitter computer is enabled to generate signals appropriate to whichever function is selected. However, in one embodiment the control key is a magnetically readable data carrier, on which a fixed program, operands and the like are stored. It appears from this that maybe the computer is programmed appropriately for the function the transmitter is to control, by reading the program from the data carrier which, on insertion into the transmitter, specifies that function. EP-A-0122548, which was published after the filing date of the present application but which has an earlier priority date than the priority date of the present application, discloses a remote control transmitter which can be trained to transmit the signal codes appropriate to one particular model or brand of a device type out of a plurality of possible models or brands. Thus if the transmitter is for controlling a VCR, it has pre-stored in it the signal codes appropriate for operation of various models and manufacturers' brands of VCRs. In the learning mode, it learns unambiguously which particular model or brand of VCR it is to control, and then later transmits only the codes appropriate for the single unambiguously learnt model or brand of VCR. Aspects and preferred features of the present invention are set out in the accompanying claims. Figures 7 and 8 show, in flow chart form, the control program for the microcontroller included within the remote control receiver shown in Figure 4. In Figure 1, a television receiver (TV) 10 receives television signals from video cassette recorder player (VCR) 12 and video disc player (VD) 14 for reproduction. Typically, the television signals are RF signals but they can also be video signals. An RF source 16 (which may be an antenna, as shown, or a cable distribution network) provides RF signals to VCR 12. TV 10 and VCR 12 include respective tuners. A switching arrangement is included within VCR 12 for selectively coupling the signals to only the tuner of TV 10 or to both the tuner of TV 10 and the tuner of VCR 12. In the latter state, one channel can be reproduced by TV 10 while another is being recorded by VCR 12. A unified remote control transmitter 20 for controlling TV 10, VCR 12 and VD 14 shown in Figure 1, is shown in Figure 2. Since many of the keys are used to control more than one device, unified remote control transmitter 20 includes device selection keys TV, VCR and VD for determining which one of TV 10, VCR 12 or VD 24 is to be controlled. The following table indicates the function or functions of the keys of unified remote control transmitter 20. As is indicated, some functions depend on which device key has been previously depressed while others unconditionally control a particular device independent of which device key has been previously depressed. Still other functions depend on which device and function keys have been previously depressed. It will also be noted that there is no ON key. This is so because the selection of a device key will automatically cause the respective device to be turned on. Figure 3 is a schematic of a remote control arrangement which can be used in any of the individual remote control transmitters shown in Figure 1 or in the unified remote control transmitter shown in Figure 2. Basically, it includes a keyboard 30 by which a user may enter commands, a microcontroller 32 for forming remote control messages in response to the commands entered by means of keyboard 30, and a driver section 34 for transmitting the remote control messages to a remote control receiver. Microcontroller 32 operates under the control of a stored program which is always the same, i.e., is independent of the type of remote control transmitter. Driver section 34 is also always the same. Accordingly, a significant part of all the remote control transmitters is the same. This reduces the parts inventory and testing required to manufacture the four different types of remote control transmitters and consequently the cost to both the manufacturer and consumer. To identify the type of remote control transmitter, certain input and output terminals of microcontroller 32 are selectively connected, i.e., "strapped", by the manufacturer either to each other, to the supply voltage (VDD) conductor, or to the reference voltage (ground) conductor in a strap configuration 36. Strap configuration 36 is examined, i.e., "read", by microcontroller 32 to determine the action to be taken in response to the activation of the keys. Specifically, the remote control messages include a preamble portion which identifies the device to be controlled and a data portion which identifies the function to be controlled. If the transmitter is an individual one (10a, 12a or 14a in Figure 1), strap configuration 36 determines the preamble portion of the remote control message. If the transmitter is a unified one (10 in Figure 1), strap configuration 36 determines the preamble, and possibly the data portion, in accordance with the contents of an external memory 38. External memory 37 also stores information, such as the skip list referred to above. These and other features will be described in greater detail with reference to the flow chart of the control program shown in Figures 5A-B and 6A-E.
Now specifically with reference to Figure 3, the switches of the various keys of keyboard 30 are coupled to a power supply switching circuit 38, in addition to microcontroller 32. When a key of keyboard 30 is depressed, power supply switching circuit 38 is caused to couple a supply voltage from a battery 40 to the rest of the remote control transmitter, including microcontroller 32. Microcontroller 32 responds to the depressed key by generating a digital word representing the appropriate remote control message. A carrier signal is modulated in accordance with the remote control message representative word within microcontroller 32, in the manner to be described below, and coupled to a driver-amplifier 42 of driver section 34. The modulated carrier is amplified by a driver-amplifier 48 and applied to a transducer 44. Transducer 50, which may comprise an infrared light emitting diode, transmits the modulated carrier. Power supply switching circuit 38 includes an "OR" function gate 46, a set-reset flip-flop (S-R FF) 48 and an electronic switch 50. When any one of the keys of keyboard 10 is depressed, S-R FF 48 is "set" whereby a high logic level (or logic "1") is developed at its Q output. Normally non-conductive electronic switch 50 is rendered conductive in response to logic "1" produced at the Q output of S-R FF 48. As a result, the supply voltage provided by a battery 40 is coupled to a supply voltage input (labeled Vcc) of microcontroller 32 and to respective supply voltage inputs of driver-amplifier 42. After microprocessor 12 has caused the remote control message corresponding to a depressed key to be transmitted, it generates a "power off" signal (a logic "1") which causes S-R FF 48 to be "reset" whereby a logic "0" is developed at its Q output. In response, switch 50 is rendered "non-conductive" and the supply voltage from battery 40 is decoupled from microcontroller 32 and driver-amplifier 42. Thus, the transmitter is only energized long enough for the remote control command to be transmitted after a key is depressed. This increases the lifetime of battery 40. Microcontroller 32 includes input and output (I/O) ports 54 by which data (in digital form) is received from and coupled to external devices. A central processing unit (CPU) 56 controls the transfer and processing of data under the control of a program stored in a read-only memory (ROM) 58. For this purpose CPU 56 addresses ROM 58, reads the instruction stored at the addressed memory location and processes or transfers data according to the instruction. During this operation memory locations of an internal volatile random access memory (RAM) 60 are used to temporarily store data as it is processed. CPU 54 addresses RAM 40 and transfers data to and from the addressed memory location of RAM 40. Timing signals for microcontroller 32 are derived from the output signal of a crystal oscillator 62. The frequency of oscillator 62 is also divided by counter 64 to derive the carrier signal. The carrier signal is coupled to an electronic switch 66 the conduction of which controlled by the bits (binary digits) of the remote control message representative word to derive the modulated carrier which is coupled to driver-amplifier 42. External RAM 37 is included in the individual remote control transmitters (10a and 12b of Figure 1) for the television receiver and the video cassette recorder and in the unified remote control transmitter (20 of Figure 2) but not in the individual remote control transmitter (14a of Figure 1) for the video disc player and is therefore indicated with phantom lines. External RAM 37 is used to store a list of preferred and non-preferred channels, i.e., a "skip list", the last device selected for control in the case of the unified remote control transmitter, and other data as well as other data indicated in Figure 3A. This will be discussed in greater detail with respect to the flow chart of the control program stored shown in Figures 5A-B and 6A-E. CPU 56 addresses RAM 37 and transfers data to and from the addressed memory location. Battery 40 is directly connected to the supply voltage input (Vee) of RAM 37 rather than through switch 50 so that the contents of RAM 37 are maintained when the remote control transmitter is off, i.e., when none of its keys are depressed. The COP 420L microprocessor available from National Semiconductor Corp., Santa Clara, California, is a suitable choice for microcontroller 32 and the COP 499 RAM, also available from National Semiconductor Corp., is a suitable choice for RAM 37. The COP 420L microprocessor is constructed with CMOS (complementary metal-oxide semiconductor) devices and therefore is particularly well suited since CMOS devices use relatively small amounts of energy. A schematic of remote control receiver section 10b of TV 10 shown in Figure 1 is shown in Figure 4. 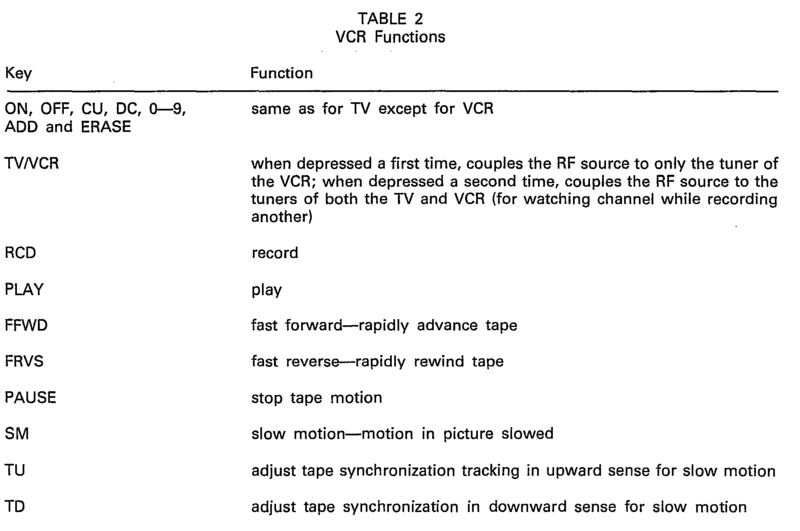 While remote control sections of VCR 12 and 14b of VD 14 are generally similar, the television remote control section has been illustrated so that the function of certain complex remote control messages discussed with respect to Figures 5A-C and 6A-D will be better understood. In Figure 4, television receiver 10 includes a signal processing section 102 including a voltage controlled tuner 102 for converting the RF signal for a selected channel received from an RF source 104 (such as antenna 16 or VCR 14 shown in Figure 1) to a corresponding IF signal. The IF signal is demodulated by a demodulator 106 to produce video and audio signals which are processed in respective sections 108 and 110. A tuner control unit 110 generates a tuning control voltage for tuner 102 in accordance with the channel number the selected channel stored, in digital form, in an internal register. A volume control unit 112 generates a volume control voltage for controlling the audio volume level in accordance with a volume level representative digital word stored in an internal register. The volume may be "muted" in response to a "mute" command signal. A main power supply 116 selectively provides operating voltages to signal processing section 100 in response to "on" and "off" command signals. Remote control receiver section 10b includes a transducer 118 from converting received remote control messages to a corresponding electrical signal and an amplifier 120 for amplifying these signals. A demodulator, which may simply comprise an envelop detector, produces a digital word representing in serial form the remote control message in response to the electrical signal provided by amplifier 120. The remote control message is examined by a microcontroller to generate the "on", "off" and "mute" command signals and the channel number and volume representative digital words. Basically, microcontroller 124 examines the preamble of the remote control message to determine if it is correct and if it is thereafter decodes the data portion of the remote control message to produce the various command and control level representative digital word signals. A standby power supply 126 continually provides supply voltages to the various portions of remote control receiver section 102 so that remote control receiver 10b is always in a condition to receive remote control messages and so that the on, off and mute commands and the channel number and volume level representative digital words are maintained when signal processing section 100 is "off". If the contents of external RAM 37 have been maintained or after the contents of external RAM 37 are set as indicated above, the keyboard is read (004). If no key has been depressed (005) and a predetermined time delay has not expired (as determined in 044, the purpose of which will be described with reference to Figure 6C), the contents of external RAM 37 are loaded from the contents of the corresponding memory locations of internal RAM 60 and the transmitter is turned off (006). This ends the program. The contents of external RAM 37 are read into internal RAM 60 at the beginning of the program to increase the speed at which data can be processed since it takes considerably more time to read and write data from and into external RAM 37 than from and into internal RAM 60. It is noted that although external RAM 37 is not present in a VD transmitter, since the program is the same for all the transmitters, coded memory address signals will still be provided at the appropriate output ports to carry out the above operations. If a key has been depressed (005) strap configuration 36 is examined to identify the type of remote control transmitter (007). This portion of the program is shown in detail in Figure 6A. If the remote control transmitter is a unified one (008), an examination is made to determine if the key that was depressed is a device key, i.e., a TV, VCR or VD key (009). If key was a device key, the mode is set to the corresponding device and stored in its corresponding memory location (010), the preamble portion of the remote control message is also set to the corresponding device (011) and the data portion ofthe remote control message is set to the "on" function (012). Then, after clearing a flag register (013) the contents of which are used to indicate whether or not a complex remote control message is to be transmitted as described below, the remote control message is caused to be transmitted (starting at point B) in the portion of the program shown in detail in Figure 6B. This causes the device selected to be turned on. Thereafter, the program returns to point A to wait for the next key to be depressed. If the mute key was not depressed, the examination of the function key that was depressed continues (from point C) in the portion of the portion of the program shown in Figure 5B. If the depressed key was VU or VD (020) and the mode or type is VCR (021) the last key (before the present one) is examined (025). If it was the SM (slow motion) key, the preamble is set to VCR (026) and the data is set to TU (track up) or TD (track down) depending on whether the VU or VD was depressed (027). After the complex message flag is cleared (024) the remote message control message is transmitted (starting at point B). If the depressed key was a digit key (028), a direct entry portion of the program (029) shown in detail in Figure 6C is executed (029) to form the two digit channel number of the desired channel and the data is set in accordance with the depressed key, i.e., the particular digit key. After the complex message flag is cleared (024), a remote control message with the preamble set to either TV or VCR (in accordance with step 015 or 017) and with the data set to the particular digit of the channel number corresponding to the. depressed key is transmitted (starting at point B). If the depressed key was either a CU or CD key (030), the next channel in the skip list is located by executing a channel scanning portion of the program (031) shown in detail in Figure 6D. Thereafter a remote control message with the preamble set to either TV or VCR and the data set to the channel number of next channel in the skip list is transmitted (starting at point B). The remote control message will be a complex message including either CU or CD (depending on whether CU or CD was depressed). As earlier noted, if the selected device was the television receiver, this causes the audio to be muted while the new channel is being tuned. If the depressed key was either the ADD or ERASE key (032), the last channel selected is added or removed from the skip list by executing a channel skip list set up portion of the program (033) shown in detail in Figure 6E. Thereafter, the remote control message with the preamble set to either TV or VCR and the data set to the channel number of the last channel selected is transmitted. In response to this remote control message generated, the last channel is again tuned. If the last device selected was the television receiver, the image will temporarily disappear and then reappear as the last channel is returned. This indicates to a user that the desired action (i.e., either the addition of removal of the selected channel from the skip list) has taken place. When a channel is added or deleted, the remote message is complex and it includes, in addition to the channel number, the command "add" or "erase". This is desirable since it allows a skip memory included in television receiver or video cassette recorder to be set up when the skip list in the remote control transmitter is set up. The inclusion of a skip memory in the television receiver or video cassette recorder allows channels to be selected at the device itself in the same manner as with the remote control transmitter. To that end, as shown by way of example for the television receiver in Figure 4, a keyboard 128 for entering channel selection commands, as well as other function commands such as "on", "off", "volume up" and "volume down" and a memory 130 for storing the skip list are coupled to microcontroller 124. Since supply voltage is always provided by standby power supply 126, memory 130 may be included within microcontroller 124 if desired. The flow chart of the portion of the program for reading strap configuration 36 (shown in Figure 3) to determine the transmitter type is shown in Figure 6A. Basically, as is indicated in Figure 6A, to determine the transmitter type, output terminals OUT 1 and OUT 2 are sequentially set to different logic states and the state of input terminal IN is examined at each logic state. The flow chart for the portion of program for forming and transmitting the remote control message is shown in Figure 6B. Before the remote control message is transmitted, the key that was depressed is stored in a memory location of internal RAM 60 identified as LAST KEY (034). Thereafter, the contents of a complex message flag register are examined (035) to determine the type of remote control message to be transmitted. The contents of the LAST KEY memory location are transferred to a corresponding memory location of external RAM 37 before the program ends (see 006 of Figure 5A) for future reference in determining the preamble and data of a remote control message (see 025 of Figure 5B). where the "bars" indicate that each bit of the corresponding digital word is complemented. Such type remote control message in which the preamble and data are repeated in complemented form is conventionally used in remote control systems to reduce the possibility of error. After the remote control message has been transmitted, the program returns to wait for the next key depression (at point A of Figure 5A). The manner in which the complex data is formed will be discussed with respect to the flow chart portions shown in Figures 6D and 6E. After the complex remote control message has been transmitted, the complex message flag is cleared (038) and the program returns to wait for the next key depression (at point A of Figure 5A). The flow chart portion for transmitting the tens and units digits of a channel number when a channel is directly selected is shown in Figure 6C. If the transmitter type or mode (device to be controlled) is TV or VCR (039), if a digit key has been depressed, "z entry" flag register is examined (040). If the entry flag is not set, indicating that the depressed digit key corresponds to the tens digit, the digit key is stored in a memory location for the tens digit of the channel number (041). The entry flag is then set (042) and a timer comprising an internal counter, is started (043). Thereafter, the digit corresponding to the depressed key is transmitted as the data portion (see 023 of Figure 5B) of a remote control message having a preamble set to either TV or VCR in accordance with the device selected for control in the case of a unified transmitter (see 015 of Figure 5A) or the transmitter type (see 017 of Figure 5A). If a second digit key is depressed before the timer has reached a predetermined count corresponding to a predetermined time (see 044 of Figure 5A) the program will again reach the portion shown in Figure 6C and as a result a new channel will be selected as described below. However, if the timer has reached the predetermined count, i.e., if the time is finished (044 of Figure 5A) the program ends (006 of Figure 5A) without the selection of a new channel. The purpose of this is to reduce the possibility of incorrect channel selections. That is, if the use does not complete the direct entry of a channel number by depressing a second digit key, it is assumed that it was because it was realized by the user that the first digit key depressed was incorrect or that the depression of the first digit was by mistake. If a second digit key is depressed, the entry flag will have been previously set (040) to indicate that the second depressed digit key corresponds to the tens digit of the channel number of the desired channel. In that case, the digit corresponding to the depressed digit key is stored in a memory location for the units digit of the channel number (045), the entry flag is cleared (046) and the timer is cleared (047). Thereafter, the channel number is stored in the memory location for the last TV channel if the transmitter type or more (device to be controlled) is TV (048 and 049) or in the memory location for the last VCR channel if the transmitter type or mode is VCR (049 and 050). Then, the units digit is transmitted in the same manner as the tens digit of the channel number. The flow chart for the channel scanning portion of the program is shown in Figure 6D. While separate skip lists could be used for the television receiver and the video cassette recorder, only a single skip list is used for two reasons. The first reason is that in a given reception area, the preferred channels for the television receiver and the video cassette recorder will for the most part be the same. Accordingly, only a single skip list is required. The second reason is related to the fact that as earlier noted for reasons of operational speed, the contents of external RAM 37 are loaded into internal RAM 60 of microcontroller 32 after a key has been depressed. While an internal RAM such as RAM 60 of most inexpensive microprocessors such as the COP420L is large enough to store a single skip list and the other information transferred from external skip list 38, it is not large enough to store two skip lists. 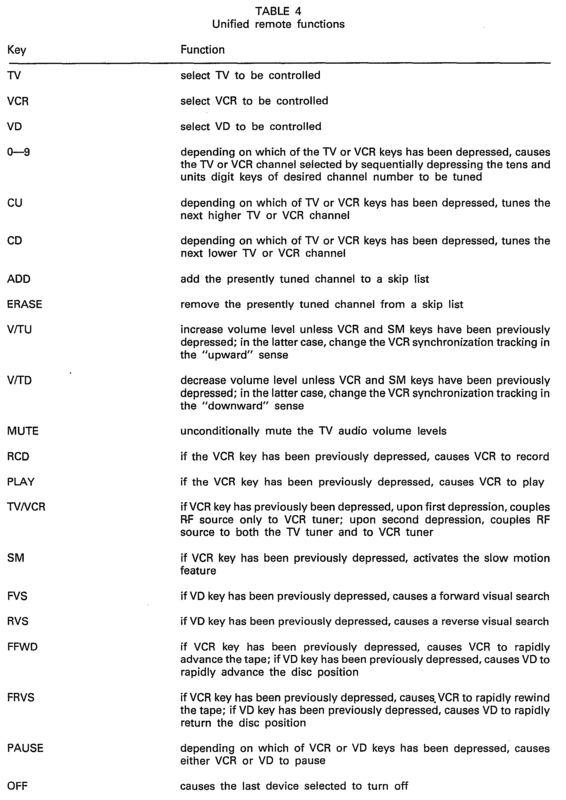 Now with specific attention to the flow chart shown in Figure 6D, if the transmitter type or mode (device to be controlled) is TV or VCR (051 ), if one of the CU or CD keys has been depressed, an examination is made to determine which one of the two (TV or VCR) it is (052). If the transmitter type or mode is TV, the channel number is set to the last TV channel number (053). If the transmitter type or mode is VCR, the channel number is set to the last VCR channel number (054). The flow chart for the add and erase portion of the program is shown in Figure 6E. If the transmitter type or mode is TV or VCR (066) if one of the ADD or ERASE keys has been depressed, the channel number is set to the last TV channel if the transmitter type or mode is TV (067 and 068) or set to the last VCR channel of the transmitter type or mode is VCR (067 and 069). If the ADD key was depressed (070), a "no skip" indication is stored in the memory location of the skip list for the present channel number (071). If the ERASE key was depressed (070), a "skip" indication is stored in the memory location of the skip list for the present channel (072). Then, the data is set to the present channel number (073), the complex data is set to the depressed key, i.e., either ADD or ERASE, (074) the complex message flag is set (075). Thereafter, the complex remote control message is transmitted. 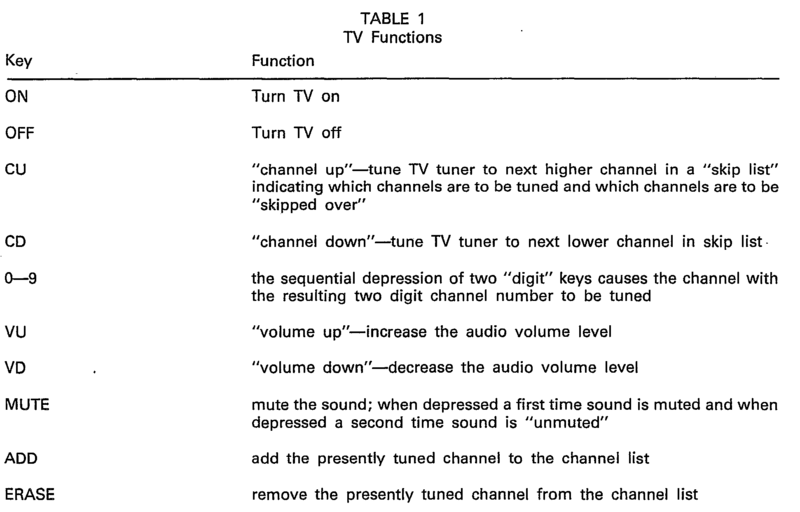 The flow chart for the program for processing received remote control messages in the remote control receiver portion of the television receiver shown in Figure 4 is shown in Figures 7 and 8. As shown in Figure 7, the program is started when supply voltage is initially provided from standby power supply 126 and a reset signal is generated by a power up detector 132 and applied to the reset input of microcontroller 124. The input terminals of microcontroller 124 coupled to keyboard 128 are monitored to determine if a keyboard entry has been made (076) and if this is the case, executes the appropriate function (077). The input terminal of microcontroller 124 coupled to the output of demodulator 122 is monitored to determine if a remote control message has been received (078). If a remote control message has been received, it is decoded (079) to determine the preamble, data and complex data, if any. The validity of the remote control message is determined by comparing the complemented and uncomplemented portions (080). The preamble is examined to determine if it corresponds to the device being controlled (081). If the message is not valid (080) or the preamble is incorrect (081) the program returns (to point A) to wait for the next keyboard entry or remote control message. If the remote control message is complex (082) the complex message is processed (083) as shown in the flow chart of Figure 8. The portion of the program for executing complex remote control messages is shown in Figure 8. Since the data portion of a complex remote control message represents a channel number, the channel number is set to the data (097). The program for processing remote control messages for the video cassette recorder and video disc player are similar to that for the television receiver except in the case of the video cassette recorder the mute signal need not be generated and in the case of the video disc both the mute signal and the channel tuning commands need not be generated. However, if desired to reduce inventory and testing expenses as in the case of the remote control transmitters, the same program may be used for all the devices. In that case, the preambles serve to route the program to portions for executing commands with which the particular device is concerned. said central processing unit (56) being responsive, under program control, to said transmitter type representative coded signals and to said function representative coded signals provided for generating said remote control message representative coded signals, which represent a remote control message including a preamble portion identifying the particular device to be controlled and a data portion identifying the particular function to be controlled; said central processing unit (56), under program control, generating said preamble portion in accordance with said transmitter type representative coded signals and generating said data portion in accordance with said function representative code signal if said transmitter type representative coded signal indicates that a particular one of said plurality of devices is to be controlled and said central processing unit, under program control, selectively interrogating said input/output unit to generate said preamble portion in accordance with a device selection representative coded signal representing the particular device to be controlled, other than said transmitter type representative signals, and generating said data portion in accordance with said function representative signals and said device representative signals if said transmitter type representative signal indicates that more than one of said plurality of devices are to be controlled. said central processing unit, under program control, if said transmitter type representative coded signal indicates that more than one of said plurality of devices are to be controlled, writing said device representative coded signals in said external memory when user activates one of said device keys and reading said device representative coded signals from external memory when a user activates one of said function keys. a battery circuit (38) is selectively coupled to said microcontroller by switching means (48, 50) for selectively connecting said battery circuit to said microcontroller after one of said keys of said keyboard has been activated and is continuously coupled to said external memory by a conductor. said central processing unit, under program control, unconditionally causes said preamble portion of said remote control message to identify said television processing system to be controlled when said television function key is operated. connecting said second microprocessor and a memory to a second circuit board, said second circuit board having at least one conductor connected to said first input port of said second microprocessor to apply said second type of data to said first input port and having at least one conductor connected between said memory and said second input port of said microprocessor for applying data stored in said memory to said second input port of said second microprocessor in order to form said second type of remote control transmitter. the transmitter having means (36) to enable selection of the operating condition of the controller, which means (36) provides a condition identification code to the controller (32) which identifies the selected operating condition, and the controller (32) responding under program control to the condition identification code to determine in accordance with the condition identification code the device identification included in any particular said remote control signal.